We have acted on feedback from patients that noise traveling from our shared waiting room with CR+ Cross Roads Medical Clinic to our treatment areas was excessive. After much anticipation, we are happy to say that we have added a new door between our treatment quarters and the waiting room. What a difference a door can make! The new door provides us with added soundproofing and helps to provide a more tranquil setting for our patients. We donated $300.00 towards CBC’s annual drive for Greater Vancouver Foodbank Society. Kudos to BC residents for their generous spirit which raised more than $534,000 for an important local need! We also encourage our patients to take a look at CBC’s Live Right Now initiative. The website is full of helpful tips for Canadians from how to get moving to eating well. 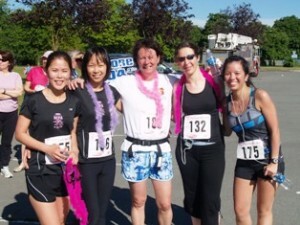 Our clinic put together a team of 5 to participate in the “Diva on the Run” 10K run on July 24, 2011. The event raises funds for arthritis research and education. We are proud of our team’s fundraising efforts, which raised $2015.00 for BC/Yukon branch of The Arthritis Society! Physiotherapist Janet Leung was the top fundraiser for the event. Thank you to friends and family for their generous support and sponsorship. We were proud to have the opportunity to sponsor Constable Shane McLaughlin on his fundraising “Tour de Valley” ride as part of the 2010 Cops for Cancer Program. A $250.00 donation was made. The DMA Clinical Pilates program was developed by Craig Philips, an Australian physical therapist and former dancer. This form of pilates extracts from traditional pilates exercises and using research-based principles, builds these exercises into an application to help people with injuries and their rehabilitation. Functional assessments are used to diagnose issues and to guide the selection of appropriate stabilization training. Proper muscle recruitment and movement pattern is emphasised over strength. 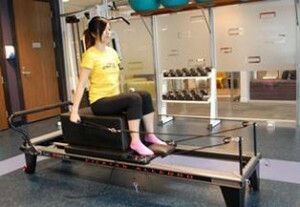 Cross Roads physiotherapist Winnie Chan is DMA-certified in Clinical Pilates. Your appointment would consist of a 30-minute, one-to-one session with the therapist incorporating mat pilates and training on the pilates reformer (some examples in the photos above). Clinical Pilates sessions taught by physiotherapists are covered by extended health benefit plans with coverage for physiotherapy. 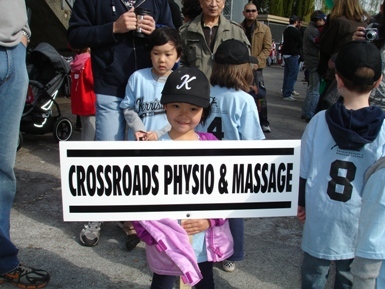 The clinic proudly supported tee ball teams in the KLL in the 2009 and 2010 seasons. For more information on the League visit KLL’s site. Our clinic celebrated its first anniversary on April 6, 2010. It has been an amazing journey of learning and growth for our entire team. A big thank-you to our dear patients for trusting us with your care over the past year! We deeply appreciate your referrals of family and friends. At our recent joint office Christmas party with the other health care clinics at Cross Roads, we asked staff to make a donation to BC Children’s Hospital Foundation. The clinics matched staff’s contribution. In total, we raised $1240.00 towards a good cause thanks to everyone’s generosity! Our very own, Dawn Sparks, was featured in the “Ask An Expert” section of the Fall 2009 issue of Urban Baby & Toddler magazine. The popular and free parenting magazine is distributed around the Lower Mainland. Read the article here ! Dawn Sparks, RMT from our clinic, was present at the BMO Vancouver Marathon providing post-race massages by donation benefitting KidSport Canada. Running group members from The Run Inn and personal training group Endorphin Junkies donated $134.10. KidSport Canada provides support to children to remove financial barriers that prevent them from playing organized sport. Thanks for your support! Thank you to everyone who came to our table at the Cambie All Access Event which celebrated the re-opening of North Cambie Street after construction for the Canada Line. It was great for our team to meet members of the community. Thank you to Ziggy the balloon twister who was a crowd favorite with children and adults alike. $123.00 was raised by your donation towards the Greater Vancouver Food Bank. We had a lot of fun participating at the Bellies to Babies Celebration on September 27, 2009 at the Croatian Cultural Centre in Vancouver. Many expectant moms had questions about pregnancy joint pain, the safety of massage therapy in pregnancy and massage therapy for infants and children. A 1-hour massage gift certificate was given away as a door prize. Thanks to everyone who came out and visited our booth!